Brad Stanek, 29, who commuted between home on Long Beach Island and college in Philly, says the closing of the tower, which he's climbed a dozen times, is a 'bummer.' 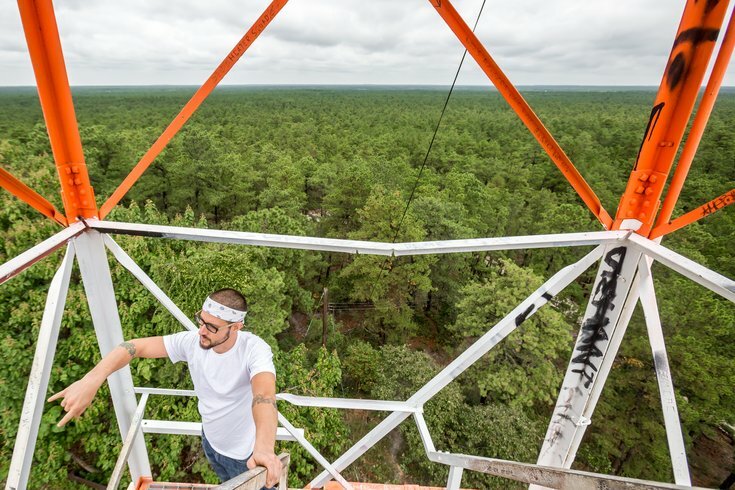 From this point in the heart of the New Jersey Pinelands National Reserve, one can see the skylines of both Philadelphia and Atlantic City on a clear day. The tower is used to observe the most fragile part of the 1.1 million-acre ecosystem and offers a high vantage point to spot forest fires. Writer John McPhee demurs when asked if his fourth book, “The Pine Barrens,” saved New Jersey’s distinctive pinelands. “I didn’t save the Pine Barrens,” the Pulitzer-winning Princeton native says of the wilderness closest to Philadelphia, the largest in the Mid-Atlantic at more than a million acres. Which, of course, is technically true. Rolling Stone: N.J. pinelands primed for worst wildfire in U.S.
Byrne, another Princeton resident, led the way toward preserving more than a million acres of New Jersey – more than 20 percent of the state’s land – by signing an executive order in 1977. But – and here is the thing -- Byrne did that after reading McPhee’s book. The 92-year-old former governor, who is not in good health, did not respond to a request for comment. The book is a seminal text, interweaving environmental reporting, history, geography and the lives of then-living characters who carry the story. This pond, formerly used as a cranberry bog, was later purchased by Andrew J. Rider, founder of Rider University. McPhee’s book introduced the larger world to little rivers such as the poetic Oswego, swaths of pitch pine and scrub oak, temples of Atlantic white cedar, roads of sugar sand and the cultivation of blueberries and cranberries. And finally the distinctive people, such as Bill Wasiowich and the late Fred Brown – pineys – who made the region home. McPhee, author of more than 30 book titles, is considered one of the foundational authors of creative nonfiction, the marriage of immersion journalism and novelistic techniques. McPhee, also a Princeton University writing professor, lives little more than an hour away from the heart of the pines. But he had never purposefully revisited the region since his research ended in 1966 – until riding shotgun fairly recently with his friend Carlton Montgomery. “It brought home some ideas,” says Montgomery, who adds McPhee deserves more credit than the acclaimed author is willing to claim for protecting the pinelands. The chief idea that came to Montgomery was making the pines more accessible through the artful writing of McPhee. 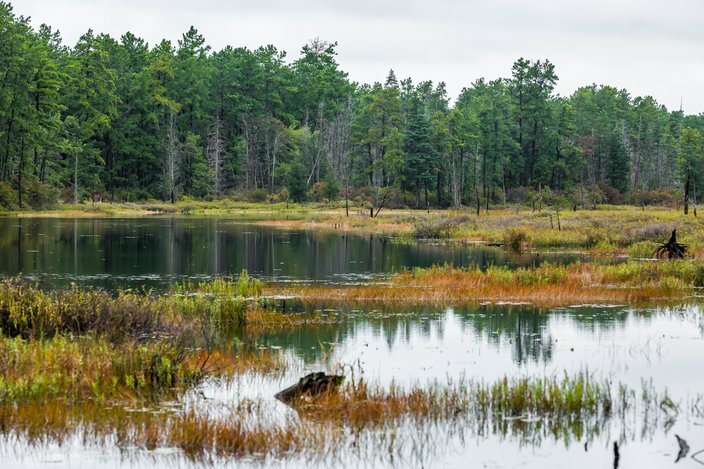 Montgomery, the leader of the Pinelands Preservation Alliance, an advocacy group, thinks getting people into the pinelands is the best way to preserve them. Reading McPhee is an easy first step. In many ways, McPhee’s book is a roadmap into the pines. 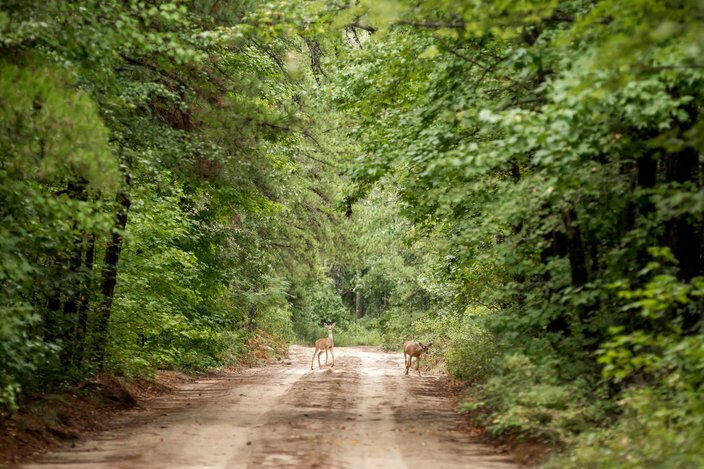 With more than 500 miles of unpaved roads in the New Jersey Pinelands National Reserve, it is extremely easy to get lost as most of the landscape looks similar. While many people featured in McPhee’s book have died, the natural scenes described in the non-fiction classic printed in 1968 remain virtually unchanged nearly 50 years later. While there are roads and some development, 800,000 acres within the larger 1.1 million acres set aside are thickly wooded, an astounding piece of preservation in the most densely populated state in the nation, Montgomery points out. In light of his contribution to that achievement, it's only natural that the “John McPhee Tour” of the pinelands would be born – with the self-effacing author’s approval. “But I was flabbergasted. It made me feel like some sort of antique,” the author told PhillyVoice on a day when he was packing up to drive from New Jersey to New Hampshire, where he and a friend were planning to do some fly fishing from a canoe. To be clear, while McPhee has happily leant his name to the tour, he is not actually on the tour. The $60 trip lasts about five hours and is largely conducted aboard a small bus that jounces about 15 passengers at a time as it travels down narrow and twisting sand roads lacing through the pines. Volpa, who taught environmental science, is an engaging and knowledgeable guide. He’s keen on visual aids, such as bags of soil, maps, charts and marked-up copies of McPhee’s work, including his other natural history and geology titles. The highlight, though, is the view from atop the Apple Pie Hill Fire Tower. The “hill” is a remnant mound of worn pebbles, deposited 12,000 years ago by the glacier which once shrouded the flat coastal plain on the southeast side of New Jersey. The hill itself is 205 feet above sea level. The watchtower adds another 60 feet. It's the highest point in the pinelands and the view is stunning. The horizon in all directions is a near-unbroken view of green. Philly is 36 miles in one direction. Atlantic City is 36 miles in the other. On clear days, it is possible to see both. On the hazy day Volpa took PhillyVoice on the tour, perhaps 15 man-made things – such as water towers and power transmission lines – were visible in a 360-degree rotation. The rest was nothing but trees. But the ugly hand of man is visible at the tower, which is pocked with graffiti, and repeatedly vandalized and often illegally entered. Because of the damage, the New Jersey Forest Fire Service has recently limited access, fencing in the tower and bolting the tower cab shut. But it’s a good move in the view of McPhee, given the ongoing vandalism. 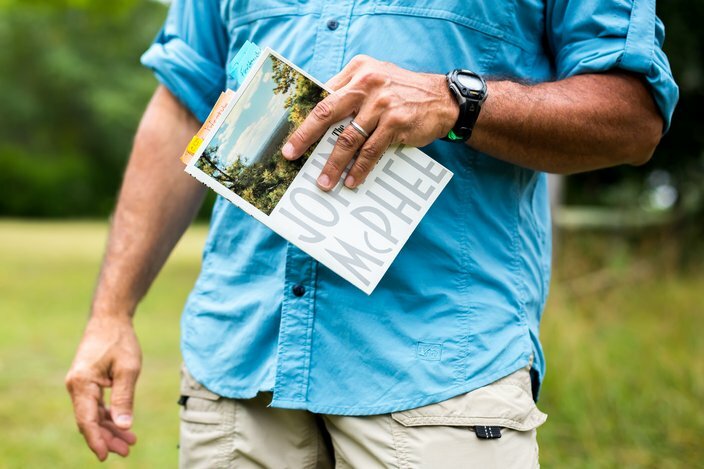 John Volpe, education director of Pinelands Adventures, holds a copy of John McPhee's book, 'The Pine Barrens'. While McPhee routinely abjures when discussing the political and environmental aspects of “The Pine Barrens” – a journalist, he sees himself outside the frame of the story, not an advocate within the story – he bristles over one issue. Prodded by Gov. Chris Christie, there is a plan to run a pipeline through the pinelands, which McPhee sees as an existential threat to the woodlands. “That pipeline thing really alarms me. The pipeline violates the legislation,” says McPhee. “When I first went there is a tale,” he answers when asked how he came to write a book on the pines, an assignment he suggested for himself based on tips – all of them eventually proven wrong – from a friend. Lately, McPhee’s been thinking deeply about his process writing “The Pine Barrens.” He is planning to use his challenges organizing disparate topics and sources as a frame for a chapter in a planned book on writing. Out the back door and under the big ash was a picnic table. The subject was the Pine Barrens of southern New Jersey. I had spent about eight months driving down from Princeton day after day, or taking a sleeping bag and a small tent. I had done all the research I was going to do – had interviewed woodlanders, fire watchers, forest rangers, botanists, cranberry growers, blueberry pickers, keepers of a general store. I had read all the books I was going to read, and scientific papers, and a doctoral dissertation. I had assembled enough material to fill a silo, and now I had no idea what to do with it. The piece would ultimately consist of some five thousand sentences but for those two weeks I couldn't write even one. If I was blocked by fear, I was also stymied by inexperience. I had never tried to put so many different components – characters, description, dialogue, narrative, set pieces, humor, history, science, and so forth – into a single package. McPhee, obviously, eventually managed to package his words into a powerful argument to preserve this ancient corner of South Jersey. In print or on a tour, the appeal of the Pine Barrens remains – for its author and his public.